Is fishing more to your liking? Well you have come to right place for some of the best Saltwater Fishing in Florida. Redfish, Speckled Trout, Black Drum, Snappers, Sheepshead, Tarpon, Snook, Flounder are just a few of the hundreds of species of fish that co exist in our diverse estuary known as the Indian River Lagoon. Do I need to make reservations well in advance? Of course not, but we strongly recommend to call as soon as possible to ensure boat availability.If you would like to rent a boat on short notice, just give us a call to check availability. On Daily Rentals, in the event you need to cancel your reservation, you can do so 48 hours prior to your rental time with no penalty. Inside the 48 hour window, with the exception of unsafe boating conditions, or a terrible rain day, you will be charged 100% of the reservation, this includes no shows and late arrivals. Two or more consecutive day or multi-boat rentals are prepaid and have a 30 day cancel period. ​Where can I go with the rental boats? Our boats are for river use only, Intracoastal Waterway. You may go as far north as the Vero Beach 60 Bridge and as far south as the Jensen Beach Causeway. Boats are NOT allowed in the Ocean or in the Jetty. Beaching Boats are NOT allowed for several reasons. What qualifications must I have to rent your boats? Is Gas included in the boat rental rate? Gas is NOT included. 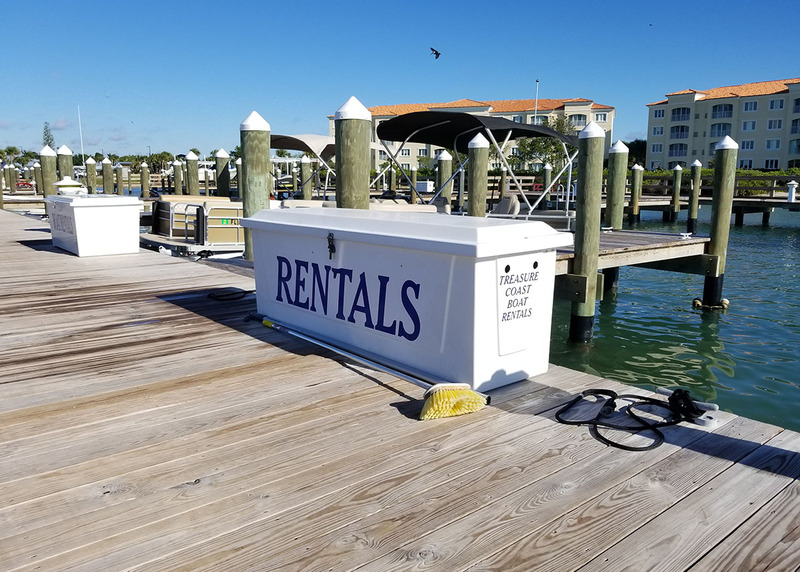 All boat rentals are FULL for departure, we ask that you top off the tank at the local marina before returning to our rental dock. You only pay for what you use, just like a car rental. This will vary depending on your use, the size of the motor, wind, current, weight and price of marine (non-ethanol) grade gas that day. ​Driver's license, credit card, cell phone. Wear "Boat Friendly" Non-Marring soft soled sandals or water shoes if you plan to be swimming and/or walking the islands looking for shells. We kindly ask that you use a towel to cover the seats when using any sunscreen and kindly ask that you do not use a "bronzer" it stains the upholstery, which you will be responsible for. You may bring your inflatable floats for relaxing and soaking up the sun. However, due to the shallow waterways, insurance regulations will not allow "towing of any kind". This is for your safety Our boats are not equipped to transport, carry or tow Paddle boards or Kayaks of any kind. Please make arrangements for these items, as they are not allowed on our boats. ​​Unfortunately, we no longer allow PETS of any kind on our rental boats, please leave your beloved pets at home. Why should I rent from Treasure Coast Boat Rentals? We have premier boat rentals. Our boats are washed and disinfected after each rental, regardless of use, we work very hard to keep them clean and maintained for your enjoyment. 80% of our customers are repeat. We offer comfortable pontoons for a fun day on the water. Our prices are very competitive, we have some of the lowest rates in the area.We are located at an ideal location.